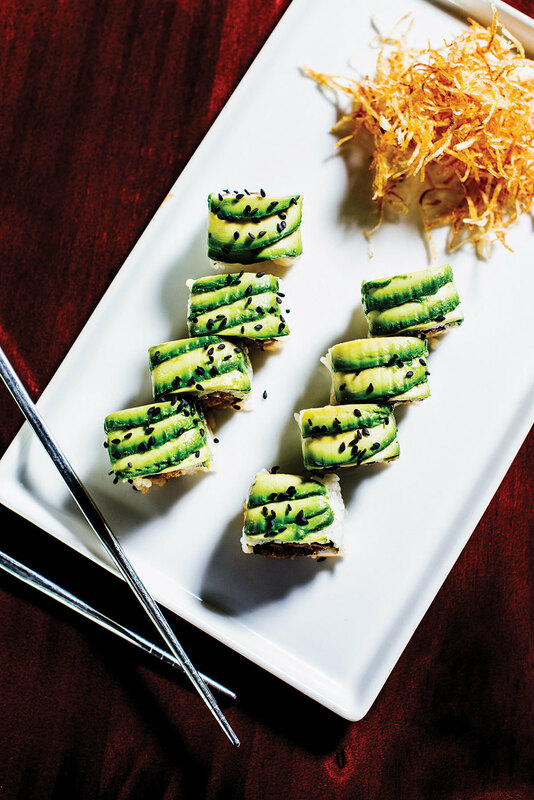 The strength of Jazz + Soju, the new Korean-influenced eatery in Locust Point’s Anthem House apartment building, lies not in its jazz or soju (Korean vodka), though those are perfectly satisfying aspects of the concept. Really, there should be another plus sign in the name, with the word “chicken” following it. Allow us to explain: When word of the restaurant leaked last year, we couldn’t wait to try its take on one of our favorite comfort foods, Korean twice-fried chicken. We heroically held off until July, about one month after the restaurant opened. That was when our crunch fast finally ended. The walls of the single-room, high-ceiling, semi-industrial space are dotted with framed album covers from jazz legends such as David “Fathead” Newman, Dinah Washington, and Ramsey Lewis. A huge cabinet filled with actual record jackets and old-time stereo equipment rests against the back wall. The goal, we’re told, is to have live music a few nights a month, though the stage (actually a nook behind the host stand) was silent during our visits. When we came for lunch, curiously, electronica was playing on the sound system. At dinner the next week, the chatter of the crowd drowned out the recorded jazz. We started that dinner with “soju-tinis,” a twist on the classic variety that uses real fruit, nectars, and soju, the Korean alcohol typically made from rice or sweet potatoes. The strawberry version was tasty but intensely sweet—we preferred the lychee one. (A sign on the front door that boasts “voted best in Baltimore signature soju martinis” made us chuckle—there’s not a lot of competition.) For less adventurous drinkers, there’s a large selection of traditional martinis, cocktails (including a “Korean Donkey” made with ginger beer, soju, lime juice, and ginger), beer, wine, and even mocktails. Heeding a warning on the menu, we ordered our chicken wings early—they can take 25 to 30 minutes to cook. Before they arrived, we sampled several dishes from the modestly sized menu. Our starters all satisfied. The honey gotchujang sauce on the excellent spicy Brussels sprouts—ordered without the bacon for our vegan friend—provided a subtle kick. The sweet sesame dressing on the mango salad, with romaine hearts and mixed greens, offered the perfect complement. Fries topped with kimchi and a tangy sauce were a nice take on a ubiquitous dish, but the best of the bunch was the fried mandu. We opted for the pork-filled Korean dumplings (shrimp is also available), which are fried (there’s a bit of a theme here), but not overpoweringly so. Main courses are less consistent. During our afternoon visit we tried the spicy chicken udon with cauliflower, zucchini, and bell peppers, topped with a Korean chili sauce, which was tasty if not bursting with flavor. Same goes for the bulgogi (marinated beef with Korean barbecue sauce), which was served over rice. Both came with miso soup, which our bartender instructed us to drink straight from the bowl, sans spoon. While waiting for the star dish to emerge from the kitchen a few nights later, we scooped wedges of seafood pajeon with our chopsticks. The crispy Korean pancakes filled with calamari, scallops, and shrimp were disappointing; the small pieces of seafood were lost in the batter. Next time we’ll try the marinated beef short ribs, which dazzled the dining room as they were served to a neighboring table on a sizzling stone plate. Our envy was short-lived, though, when our chicken arrived piping hot. We split our order of 10 mini drums and wings between the regular soy garlic sauce and the spicy version. Both were outstanding. What makes this truly a dish to die for is the way the incredible juiciness of the meat melds with the crunch of the skin, which is fried in soybean oil to dissipate the fat. While you have a feeling that what you’re eating falls short of say, quinoa, on the health-food scale, the wings are surprisingly devoid of grease. Jazz + Soju still has some kinks to work out. The restaurant was out of several wines the night we visited, and the staff was unsure about its own vegan offerings. What some parts of the service lacked in execution, however, waiters made up for in effort. Each one we encountered was friendly and attentive, and seemed genuinely invested in getting things right. And ooh, that chicken. On our way out we took note: There is room for another word on the sign. 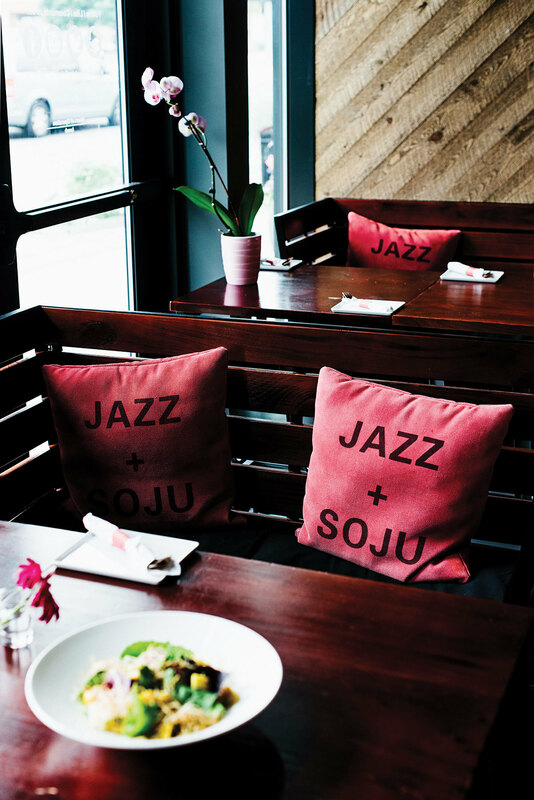 JAZZ + SOJU 900 E. Fort Ave., 410-244-8600. HOURS Mon.-Thurs. 11:30 a.m.- 2:30 p.m., 4 p.m.–11 p.m. Fri.-Sat. 11:30 a.m.-1:30 a.m., Sun. 11:30 a.m.-9 p.m. PRICES Starters: $6-15; salads: $9-14; rice and noodles: $13-16; share plates: $13-19; chicken: $18-23; sushi and sashimi: $6-14. AMBIANCE Jazzy.